Plot synopsis: A 'morality' tale about a young man who proclaims that he will bet the Devil his head in relation to almost any gambling opportunity he encounters, but who eventually learns that this may not be the wisest bet to make. Based on a short story, 'Never Bet Your Head: A Moral Tale', first published in Graham's Lady's and Gentleman's Magazine, in September 1841; and later in numerous collected volumes, usually as 'Never Bet the Devil Your Head', including The Complete Stories and Poems of Edgar Allan Poe, first published in 1966. Plot synopsis: A man is plagued by a series of bizarre and disturbing nightmares. Review: Listening to other people recount their dreams is almost always incredibly tedious. Dream sequences in fiction are often not much better - since 'dream logic' allows writers to justify virtually any occurrence or behaviour on the part of characters, they frequently become a dull series of meaningless implausibilities. So it is to this episode's great credit that it remains compelling from start to finish, even though almost its entire length is devoted to a string of connected nightmares. Some elements are even genuinely unsettling, especially the recurring character of the man with the moustache, together with the repeated blows inflicted upon the protagonist, which are accompanied by ominous sound effects. Best of all, the symbolism deployed in the story has a definite purpose and the ultimate explanation given at the end for what we have been listening to is both clever and satisfying. Plot synopsis: In Medieval Japan, its ruler sets out on a pilgrimage which leads him to face a terrible enemy, but also forces him to confront his difficult relationship with his son. 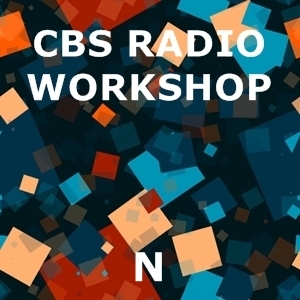 Based on the Japanese plays translated by Arthur Waley in The Noh Plays of Japan, first published in 1921.
Review: One of the CBS Radio Workshop's greatest strengths was the diversity of subject matter with which it dealt. Not many other OTR programmes would have presented an adaptation of Medieval Japanese literature, so it's to the series' great credit that it undertook the unusual and challenging task of doing so. I was intrigued enough, at any rate, to look up the original source - Arthur Waley's The Noh Plays of Japan - a collection of a number of Medieval Noh plays, dating from the fourteenth to the sixteenth century. This episode appears to be an amalgamation of various of these and does a good job of representing some of the common tropes and themes of the plays. The material is treated with due respect and the presentation is in many ways excellent, especially the authentic music. Even so, it cannot be denied that in places the story can be heavy-going - there's no humour to balance out the more serious elements and it can also be a little stodgy. Moreover, at times the choral music drowns out the narration, making it very difficult to hear. Finally, the visual aspects that are so central to Noh plays - the sets, costumes and masks - are obviously absent from this radio adaptation which, even if unavoidable, diminishes the story's impact. Still, a valuable and worthwhile exercise.